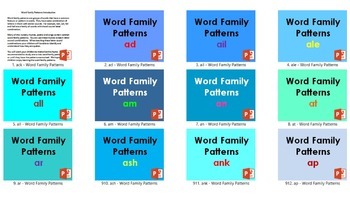 Word family patterns are groups of words that have a common feature or pattern in words. They have some combination of letters in them with similar sounds. For example, ball, call, fall and hall are a family of words with the all sound letter combination. Many of the nursery rhymes and poems contain common word family patterns. You can use these rhymes to teach letter sound combinations. When teaching these letter sound combinations your children will be able to identify and understand how they are spoken. You will want your children to memorize the rhyme. It is recommended to study one to two word family patterns a week or until they have the patterns memorized. 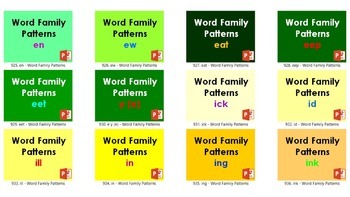 We hope your children will enjoy learning the word family patterns. 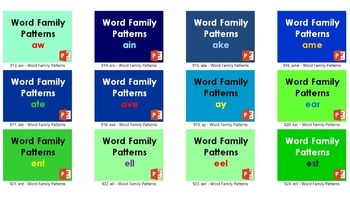 Every month we will continue to add more words to the word family patterns, and activities for your students to engage in. Once purchased, you will get the updates for free. These PowerPoint presentations have been viewed over 100,000 times on YouTube! 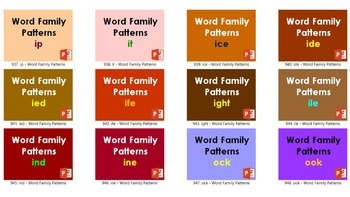 What Are Word Family Patterns? Remember, every month we will continue to add more words to the word family patterns, and activities for your students to engage in. Once purchased, you will get the updates for free.